We are heading north away from very beautiful Santa Maria. Hopefully the easterly winds that are promised for a day or so will get us well to the north. 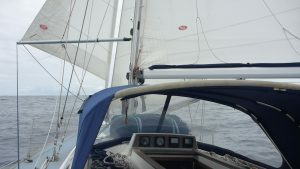 We are romping along at 7 through the water with 15 knots of breeze over the deck. It’s overcast and warm. Later on tonight we should clear the eastern end of San Miguel and be clear of land and traffic. I am expecting very variable winds in the next ten days or so. With the jet stream parked so high hopefully we will not have any heavy weather. 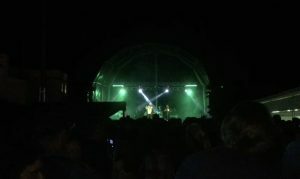 Last night I went to a Folk Festival in Maia! Very kindly driven by Robert and Heidi SV ‘Pura Vida’. 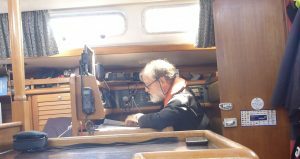 They were heading for the mainland two years ago, stopped here and had all the repairs done in the immaculate boat yard in Vila do Porto. They like it so much they have bought property. Another Couple have been here a year carrying out repairs, Ray and Ulli. They re launched the day after we arrived. 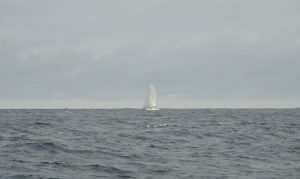 Rolf and Steffi in an immaculate Halberg 41 (same designer and look of the 352 and a 1987 boat) are wending their way slowly south. A special couple! Liked them a lot. SV ‘Piccolina’. I’m looking back over the starboard quarter. This side of the island is as we first saw it approaching from the other side. The peaks are cloud covered. I’m going back hopefully with Sally but by airplane. I think this voyage to Falmouth could take as much as fourteen days. 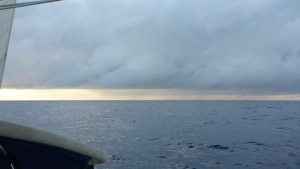 We are in to day 2 out from the Azores. A 24 H run north to midday today of 140 NM in variable easterlies. We’ve been able to sail it. It’s been overcast with a little rain but temperature still warm. We received a very king send off yesterday. It was nice to have met some pucker long distance travellers SV ‘Piccolina’. Breaking the voyage down helps a lot. Today will be spent keeping us moving in the wind shifts and strengths. 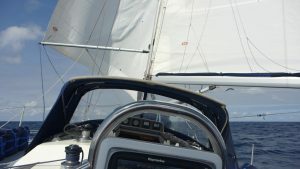 Yesterday evening close hauled on starboard we were reefed and flying the stay sail. Today we are under full sails trying to keep momentum. The expected wind shift is due tomorrow. 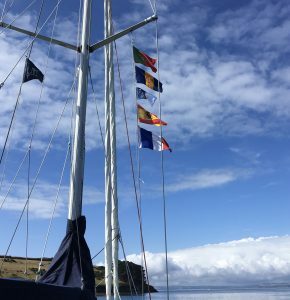 The wind backs slowly northerly and then we will tack and head east as high as we can until the predicted westerly and south westerlies arrive sometime around Saturday. It will all change again for certain. Some of the SW winds look potentially quite strong. I’m getting my head down as much as possible. V close approaching 2020 BST from port quarter passed half a mile in front. Absolutely wierd. Thought they were pirates. 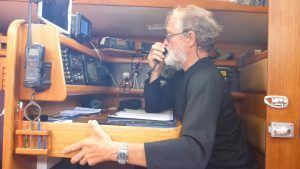 No reply on VHF. Nothing. They are now off starboard bow. 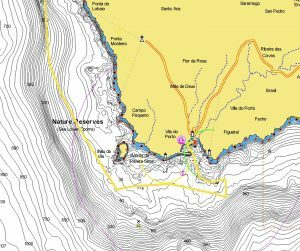 Note – It was the “Mar Portugues”, a trawler. 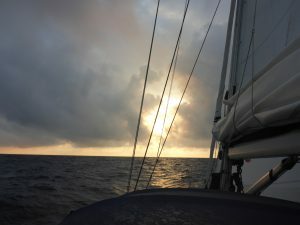 We are sailing N over a flat sea in very light NE winds. 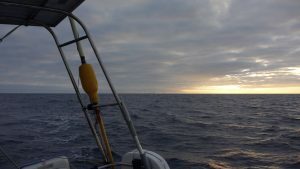 9 knots over the deck gives us 4 through the water but the wind is going to build gently now to the east of us and then back north and eventually north west. When to tack? And perhaps we motor this section? The wind will decrease to nothing here, so the grib maps tells me. A cup of tea. Enjoy the dawn! The engine will break the spell! Tea drunk the wind has made the decision. The wind virtually died. 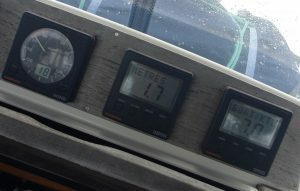 We are powering east at just under 6 knots in the hope of finding some wind this evening. 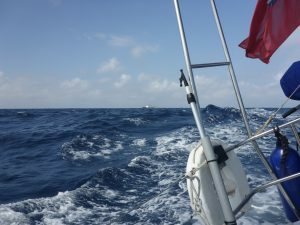 We have covered 250 NM through the water from Santa Maria. 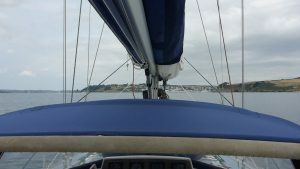 This time last year when I set off alone from Stavanger I thought that 260 nautical miles was a long way to sail alone to Scotland. My longer voyages of this sort of length have been with peoples. Off watch your sound asleep, as part of a crew, keeping yourself in good shape for your next watch. Off duty your senses can be rather more relaxed as part of a crew. 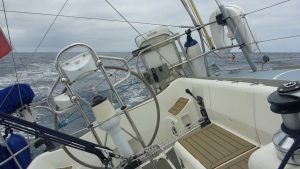 But across Biscay and then the 800 NM from N Spain to Madeira changed my feeling for distance. 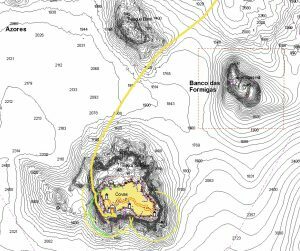 550 NM from Madeira to the Azores was then not that far! I found, as a coastal, southern North Sea sailor I had always been thinking about arrival. On the way to Peterhead last year was the first time I did not think about arrival. We get there when we get there. It’s made me much much more patient and content closing on a destination. It was more enjoyable! Preparing for arrival became more thorough. There is no hurry. Twenty four hours out now and your nearly there. Before, 24 hours was a voyage! Sometimes, of course, you need to be as fast as you can to beat some weather. I have a long way to go now over the coming days. A test of my comfort zone. I will be so pleased to get home safely with my ship but I do not wish it over. I will hopefully have a tiny bit of understanding of my friends, some of the best people I have ever met, who have sailed a very long way across the oceans. That did not last long. Engine off! 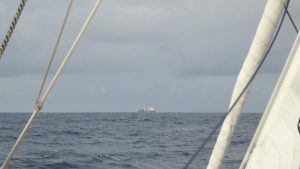 We are now close hauled on port in north easterlies errrrr heading for …. Lisbon! 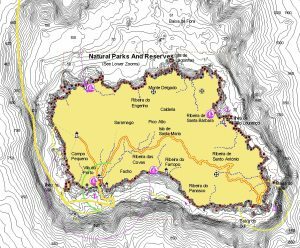 Four different grib maps show varying information. For the most part these winds should back eventually enough for us to lay a course north east. It all looks quite different to yesterday’s download. Continuing as we were would have found us in no wind at all. 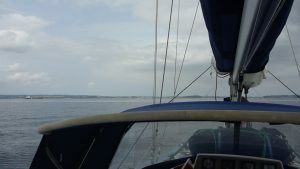 On starboard the cabin slopes down to port and vice versa so now we are on port my equilibrium is being tested. As can gravity and the fridge. 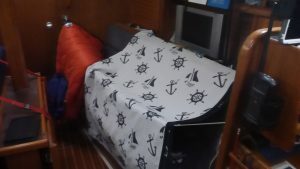 And which pilot berth to sleep in! A ship a ship. First traffic since the Azores. The CS ‘Crete 1’ bound for CA HAL. Anyone know where that is? Short for something in ship language. 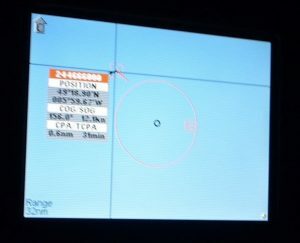 We are now on a course of 85 compass but airs are very light. 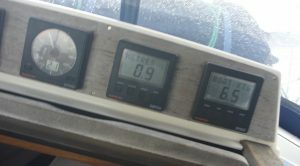 9 knots over the deck. So direction Finistere! Better! A few minutes later and we are now heading for Gibraltar ? Midday today we will have been 73 hours at sea. The 24H runs have been 143 NM and 133 NM. This last 24 has seen us cover another 124 NM. Over the ground we have covered slightly more. 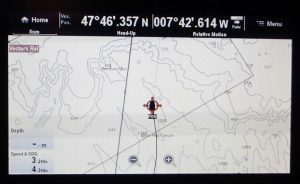 A small lift from an ocean current helping us along. The wind is just east of north so we are close hauled on port. 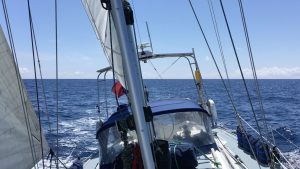 Over night we had a reefed main and stay sail. 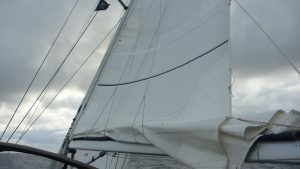 This morning the wind had backed slightly and we furled the stay sail and set the Genoa. Later the wind will veer again just east of North until at least Saturday which should hopefully have us approximately 43 N and 13 W. WNW of Finistere. The wind is predicted to be slightly stronger. Got to be careful on deck in bare feet when the sun is out. I could have burnt the soles of my feet. This morning was the first time there was some morning dew and it’s very slightly colder. I’m still in pyjamas though to keep cool. Out of nowhere yesterday a boat came towards us from our port quarter. AIS had us pretty much colliding. Only their MMSI number showed. 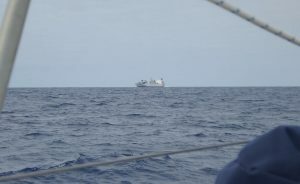 As she got nearer it was definitely a fishing vessel. She passed half a mile in front of us! 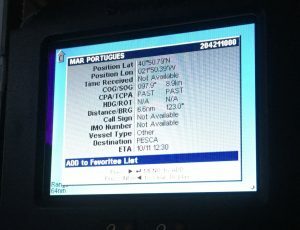 No reply on VHF. No sign of life. Her name popped up on the screen just as she was nearly out of sight ‘Mar Portuguese’. I woke a watch officer earlier in the afternoon. 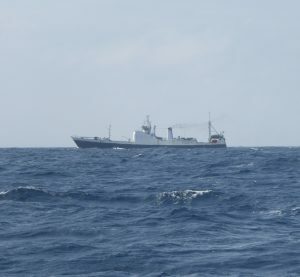 CS ‘Pacific Reefer’ was baring down on us from the N at 17 knots. The ship turned to starboard. We wished each other a good watch. My tomatoes are pretty much overdue so got to eat the whole supply soooon. My lovely green bananas have ripened as fast as the yellow ones. There ain’t nothing like Maria Santa small melons. Delicious. Out of them too now. But enough food on board to last several weeks. Loads of tinned fruit! Checking the ship … and I am wearing a harness!! It’s 1500 as I finish this mail. 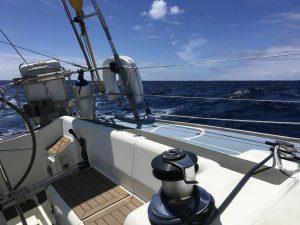 We’ve been making a comfortable 6 Knots close hauled with a pretty consistent 14 knots of breeze over the deck for most of the day. The sun has been shining hot all day and I’ve spent the last two hours with my sextant. Impressive results. I’ve now got to do the Maths. Where is a Doc when you need one? 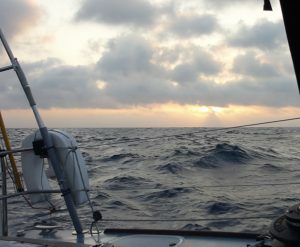 As of noon today BST we’ve run 536 NM through the water. Over the ground a bit more … 566 NM. Just under 100 hours underway. Wind shift at 1830 yesterday evening meant heading for Gibraltar! Then it settled northerly. 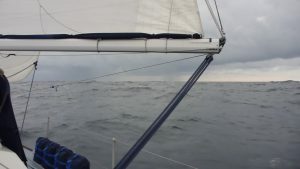 Close hauled we are heading ENE until Saturday when we are supposed to get NW winds which will allow us to lay a course for the Channel and the Western Approaches. They do look fickle and light. 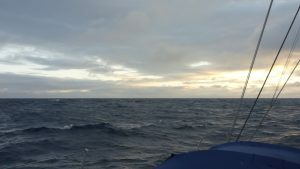 Let’s concentrate on the next 24 H.
Last night was turbulent as we beat against variable wind strengths ending up at midnight with a couple of reefs in the main and flying the stay sail. 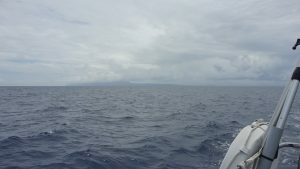 The sea was sloppy and uncomfortable as ‘Talisker 1’ at times, smashed her way to windward. I have some sleep to catch up on. We continue to sail on. Clouds have to be watched but down below lying down I’m pretty quick to get up and get on deck. 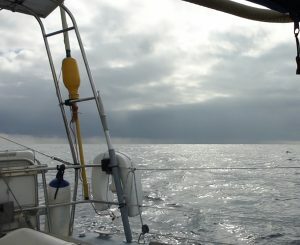 Disappearing astern of us a squall, her skirts right down on the waves, our grey forbidding visitor is fleeing south. She brought 30 knot gusts as she came by. Reefs have never been in so quick. Behind her, blue skies, a breath of breeze and a wind shift. NNW would you believe. We are now heading NE again but not for long. 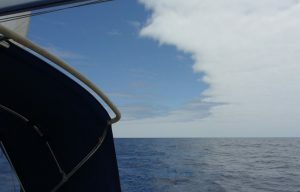 The wind veers back north, we could set the genoa and shake out the reef but there is more cloud heading this way and with the wind back up we are making 6 through the water with stay sail and a reef in the main. The ocean is punishing on a boat. Days and days of non stop wear and tear. Parts being worked constantly, caked in salt water. It gets everywhere. It is so tempting to hoist full sail but being underpowered and nursing seems to be key. I find myself looking for weakness. As wonderful Kara and John, US SV ‘Sentijn’ say .. “it’s a marathon .. not a sprint”. A 2nd reef back in the main, now no wind and rain… ? And we have now covered 600 NM since leaving Santa Maria. Uncomfortable night bashing in to northerlies close hauled. Lumpy seas. But she does not get stopped. I’m 42 21 N 18 23 W. I continue like this until Saturday morning by which time we should be 43 30 N 13 25 W by which time I’ll just be gums! Tack and head NNW until wind backs and we resume course for the channel. No it’s about all you can do to play the angles and get set for the new breeze. You’re doing all the right things; just got to keep plugging away until Saturday’s switch. Its a marathon–not a sprint–as there’s a fair wind on the way and nothing scary on the forecast….so don’t forget to look after yourself too! A few hours hove-to for a comfortable meal, a cup of tea that don’t slosh out, and a longer stretch in the bunk always does wonders for me when it all just seems like too much work! 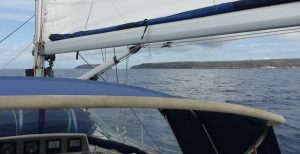 We’re in Bantry Bay doing some shopping and watching the weather for Biscay crossing. Mostly light winds forecast, so we’ve got out the full-size spinnaker and are trying to figure out which end is up…doih! I’ve just slept about six hours but still broken of course! Now that’s better! We were surrounded by squalls yesterday evening. Some could not be avoided although we did one, running away from it as it passed astern. The edge was windy enough. Full oilies on, rain. Gusts 30 knots. I’d popped a third reef in the main for that one. 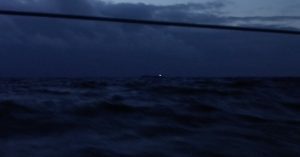 When it passed with darkness approaching I left the deep reef in and we forereached slowly, but comfortably, in to a messy sea state. This is ok! Forward momentum. Control. No stress. In to my pilot berth 2230, out at midnight, a check around and then set an alarm for 0600. 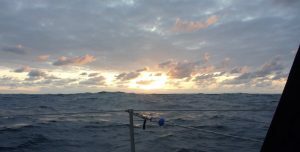 We still made 29 NM in the six hours. What did you say John P? In your email of yesterday! :-)). 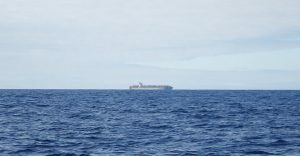 Two ships yesterday evening, one followed the other, both baring down on us from the north. I’ve widened the guard on AIS to its maximum. If a squall appears red and menacing on the screen radar seems to set off a cacophony of alarm sounds. At some point in the next 24 hours we will tack on to starboard. I was thinking of taking out that reef having freed us off after the first cup of tea but I’ll have some breakfast first, then another cup of tea, then think again. No one sleeps while I’m awake! My Mum, who gets these bulletins via Sally, will have to remind me who said that! The late Rod Taylor said it to one of his bodyguards. He arrived in Nice in the Spring of 1965 to film “The Liquidator” playing the lead role of “Boysie” Oakes. It was a black comedy and MGM in an endeavour to compete with Salzmann and Broccoli’s James Bond deployed a host of mainly British comic actors to augment the hero’s travels between London and Monte Carlo carrying out assassinations for the British State. Hence the inclusion of Eric Sykes, John Le Mesurier, Trevor Howard and our late Papa… From America they got in Jill St John and Akim Tamiroff (Oceans 11). “No one sleeps while I’m awake …! I hope your fishing in Newfoundland was successful. And your return to Vigo is unremarkable. I like my sailing unremarkable. It hopefully means safe! This email address is only for words. Not attachments. It would be really cool if you sent an email to my wife. Really cool coming from you. Saying you have seen us. I have also taken pictures. Hi, James!!!!!!! Glad everything is ok with you and the ship, she is really a beauty 🙂 nice sails, well trimmed, fast and stable. So the emails are checked, and of course I will send you wife and email and at least a picture (due to slow speed broadband on board). Once ashore I send the rest, and the video. Stay sharp, stay aware, stay safe and I sure everything is fine. Sally will be terribly surprised to get an email. I am so pleased. Yes! Enjoy! If it’s not enjoyable one is doing something wrong. Many thanks again Captain Vilar. different for all. Values, tradition, seamanship. ships) at 12.7 miles. Don’t worry you are well visible my friend. built in an era when ships were built to last for ever. anxious to get home (74 days at sea now). I’ve just had one of those extraordinary encounters at sea. 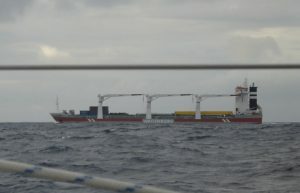 Late this morning I was watching a vessel approaching from astern. 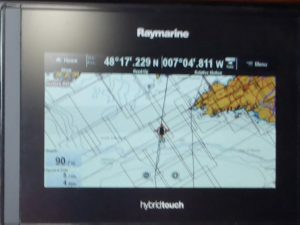 To begin with on AIS all you see is an MMSI number. 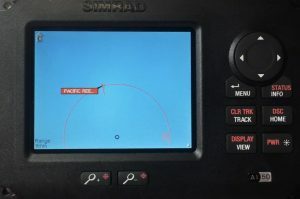 Eventually the name of the ship will appear on the screen. Out here in the clear air you see them in the distance very quickly. This ship was going to pass half a mile away. It was also a FV. A large FV. Was it going to be a repeat encounter of the 10th? I called on 16 and got an immediate response. Don’t worry we see you … we are deciding which side to pass you. And then … can I help you with anything? Do you need a weather update? Where were we heading etc. I asked if the fishing was good? They were returning to Vigo having been fishing in Newfoundland. The Captain sails boats so there was a common sympathy and I was talking to the Captain himself. Before her name ‘Lutador’ came up her white superstructure had had me thinking yacht! Dare I … dare I? I called again. Immediate response! I’m so sorry and I feel terrible asking but ..
Captain Alfredo Vilar knew exactly what I wanted. Photography! Of course of course. Your a solo sailor … I understand. Stay on your heading and leave everything to me. We have great controls on this ship. We chatted some more. Alfredo sailed from a small child. 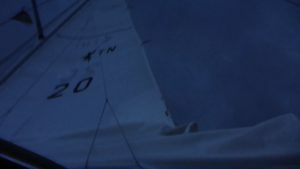 He’s sailed all manor of dinghies including a Laser. He raced a Dufour 44 ‘Bull Energy’. Lots of racing. Slowly she came abreast on our starboard side. I’d told Alfredo I would take pictures too. Yes please but we’ve been photographed by everything including satellites! Can I call family to say where you are etc? I told him we had that sort of communication on board. How cool is that to ask though? We meticulously exchanged emails, Facebook etc. As her white superstructure and blue hull pulled away the Captain asked me for my route home and gave advice. Traffic don’t always see you .. beware and keep a good look out. Don’t go near Finistere. Avoid Biscay. Take great care. I feel really chuffed with human nature. I met a really kind professional sailor today. Nothing was going to be too much trouble. A person who understood what those of us at sea share. I last experienced this casting off in Santa Maria. The look of concern, knowing what was ahead for us all setting off in to the sea. That was Rolf’s look to me when he said goodbye while helping me with my lines. It’s got really windy out here. 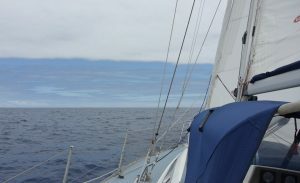 Back to a triple reefed main and stay sail slogging ENE to windward on port. When to tack is the question. It’s strange to say this evening? Or in the morning? Does it matter when time has no relevance? 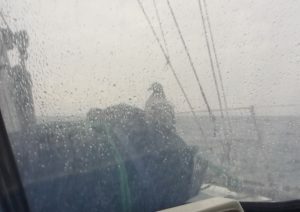 Late on the 14th .. a passenger and we are on a starboard tack!! 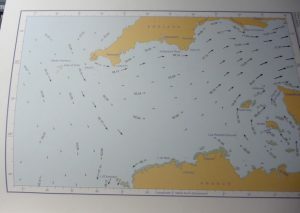 We are 130 NM NW Cape Finistere itself. 0700 BST today. 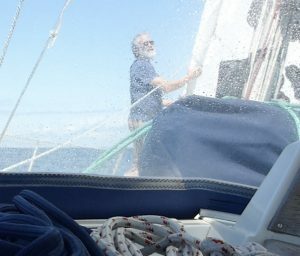 We had been close hauled sailing as high as we could for several days. The 13th was a long day, bar the fabulous encounter with Captain Alfredo and his ship ‘Lutador’. Every blow to ‘Talisker 1’ was felt. 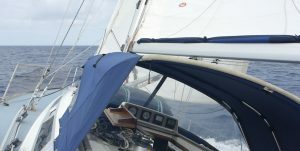 Despite being reefed and for some time being triple reefed with stay sail she felt like she was going the rounds with Mike Tyson. Except unlike his opponents she’s still, god willing, cutting a path towards the English Channel. Nothing stops this boat. Finally we tacked at 1615 yesterday and headed NW for nine hours. About 60 miles. 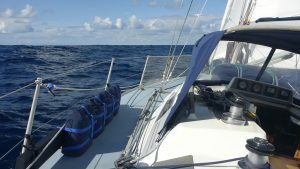 At 1800 the wind abated a little and we set the genoa and furled the stay sail. At 0150 this morning we tacked back on to port. And took out the first reef in the main. Later today the wind should die and back. This evening we should have favourable NW winds. They too will die. We might have to motor a bit. Since Santa Maria we have run the engine only to charge the batteries. I’m no longer single handed. An overnight guest and he is still here this morning. I laid on breakfast, loads of water and some cereal flakes. He’s fouled the sheets! When I put the small pan next to him he did not back off. Nor did he hesitate to tuck in when I retreated in to the cockpit. 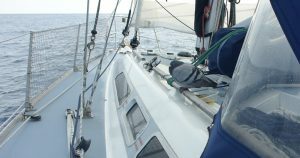 My crew mate is a tagged homing pigeon! 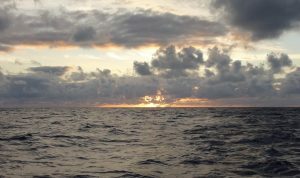 The days of going to windward, smashing through the Atlantic has caused a minor weep from the hatch just forward of the mast. I meant to have it off and re bed the frame when I did the large fore hatch. You never get everything done. It’s a job that won’t take long. A well fed bird .. The ship is caked in salt to the mast head. Rest is pretty key now. The last 48 hours will be quite busy with traffic. 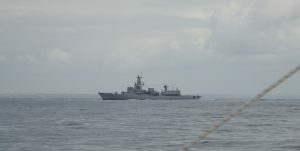 We encountered our first ship this morning since the ‘Lutador’ on the 13th. 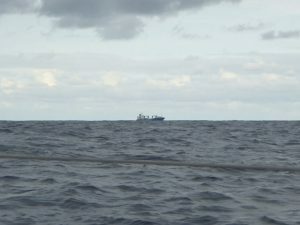 The ‘Nasa Neslihan’ bound for Baltimore. I felt sick last night. I had been feeling so good. Just queezy lying down. Truth is, although I drink lots, you lose appetite. So I had a large bowl of cereal, raisins, the last banana and honey. Followed by several of Mums crystallised stem ginger cubes. I felt tip top after that! Thank you to my weather watchers. If you can see anything over the next 4 days let me know. 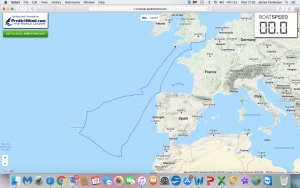 If you drew a line between Ushant, NW France and the NW tip of Spain and then drew a line parallel to that one 120 miles to the west, we are about a third of the way up that line. 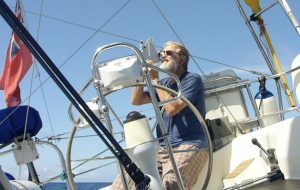 A squall had me tumbling out of my pilot berth at 0545 to double reef the main, furl the genoa and set the stay sail. It’s tempting to take a reef out but there are some clouds I’m not that keen on. We had to motor yesterday in beautiful sunshine with very little wind but today we should have enough until this evening. We sailed overnight. 0830. 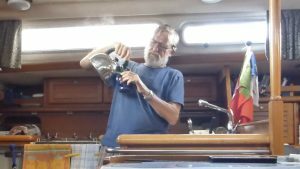 We shook a reef out of the main and are now flying the genoa again. The balance today is to sail as efficiently as possible. I should have plenty of Diesel. The Western Approaches look to be pretty windless for the last 140 NM. This evening the wind could start to die properly. A catamaran has just passed us port to port. No AIS and no response on Ch 16. Empty cockpit too. It did look as though she turned to starboard. 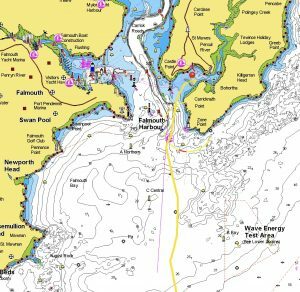 It looks like we should not be far off Falmouth late on the 18th but we probably won’t go in if it’s dark. Just as easy to carry on to Plymouth and arrive in daylight. We will have to see! But there is the next twelve hours to deal with only. Has anyone been in to Falmouth? By boat! Of course those big Cats have a wheel house! You can helm in comfi slippers and a dressing gown. So there was probably someone at the wheel. 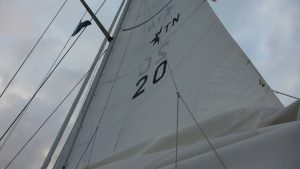 Wind today anything from 9 – 27 knots over the deck so multiple sail changes. But it’s been a good day for making progress. Interesting conversation with ‘Ocean Ambition’ cargo, bound for Rotterdam. “Affirmative your off my port quarter.. I’m off your starboard bow…. 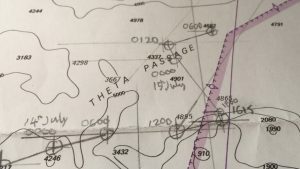 “That is correct Sir” … no wonder the merchantmen confuse each other so much when we listen to them in the S North Sea at cross purposes. Agreeing but not understanding they’ve actually agreed. It can get quite animated. So just trying to make as much speed as possible without pushing her before the wind goes. Yesterday, in virtually no wind I temporarily patched the hatch that was weeping slightly. It’s not leaking anymore. ‘Talisker 1’ has been taking body blows! It seems two more nights, god willing, and then late on Wednesday we should be sighting the Cornish coast. We are truly now in shallow water. Still deep for a southern N Sea sailor. Over a 100 metres. So we are well on to the continental shelf. It seems that we should be close to Falmouth early afternoon tomorrow. I don’t want to speak too soon. We still have another night and dawn at sea to come. We are coming up to 1,300 NM logged since leaving Santa Maria. Tidal Stream Atlas English Channel! Time to check! We have light W winds. 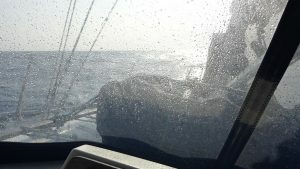 We are currently motor sailing under full main and stay sail on port and the Genoa poled out well forward on starboard. 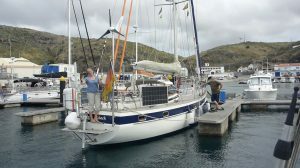 I’m hoping we stay in what wind we have and once batteries are charged switch off the engine. On ‘finals’ concentration is very important. It’s easy to drop your guard. It’s easy to think you’ve arrived! We arrive WHEN we arrive and this is the time to be on our metal. I’m pretty well rested. I will try and get some more sleep today as traffic will build overnight and tomorrow. Thank you everyone for your emails on Falmouth. 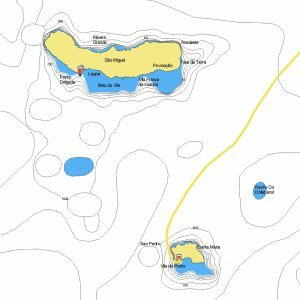 It will be a marina for a day or two and then if the weather is right ‘Taipans’ anchorage at St Mawes to prepare for heading up Channel. We will day sail in those congested waters to wend our way home. 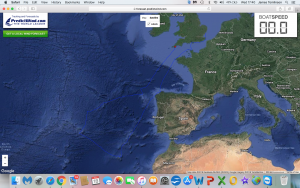 There was a huge contrast between the two legs from Ushant to Al Coruna and then on to Madeira and the two legs from Madeira first to the Azores and now the current one from the Azores to the UK. We’ve logged 3,300 NM since 1st June. Now that we are off the shelf I have done what I’ve wanted to do and prepared to do for so long. A small voyage alone in the ocean. It’s been a completely humbling experience. I now have an inkling of what some special friends do all the time. Perhaps I can do an ocean crossing one day! That would seal it! But it would be on one of those special peoples boats as their deck hand. If they would have me! It’s now 0300 and I’ve had a little sleep. Enough. 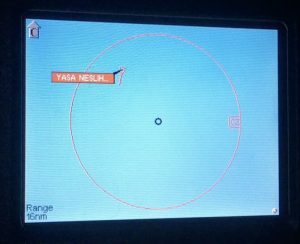 AIS targets started their alarms about an hour ago. Much as I expected there is traffic. So happily up now. I’m so pleased we are still sailing. I thought it would have been more of a struggle from the 14th. But hardly motored at all. The engine hours on this leg are almost completely battery charging. The one disappointment of the voyage. But we did carry loads of fuel. The lights of the Scilly Isles have been visible since 0200. A few people were surprised we did not stop in N Spain! 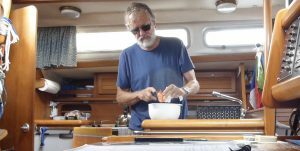 Me and ‘Talisker 1’ came on this voyage to experience ocean sailing and to sail it, as Doc quite rightly put it, using the ocean as a friend. I think he said “see the ocean as your friend”. Managing me and the ship were key. I had to be rested and well enough to run the ship. Nurse her, not over pressing her (and my was she brave) and sail her as efficiently as my skills allowed me to. ‘Talisker 1’ is a sailing boat. 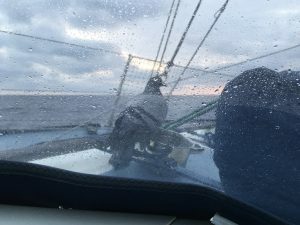 Prior to leaving the U.K. in June I’d sailed her for several years on all points of sail in trying conditions. She’s fast and stable. I do know her intimately. On this voyage we were going to take windows offered and carefully studied long term forecasts. In no order but James Robi, Simon, John P and Raymond have been so kind emailing me to confirm that what I was seeing matched what they could see. Keep trucking was the word. 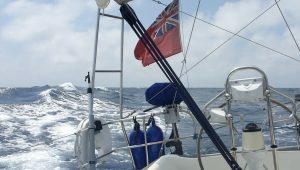 For the Azores UK leg there was nothing untoward in the forecast. Nothing to frighten! As far as we could see. Just hard work. 1) the weather was still fair to continue. 3) it was not what we came on this trip to do. 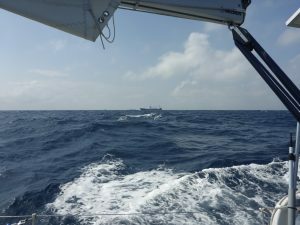 5) our course home when we finally headed for the western approaches was well outside Biscay … as planned. 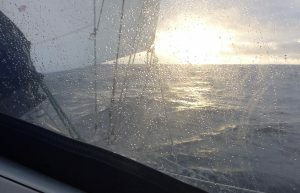 6) me, James, John, Simon and Raymond had been watching the weather for days as we made our way east close hauled. It was never not good to go! I feel the ocean gave us our descent south to Madeira. However windy and rough, it was never taxing. From Madeira to the U.K. via the Azores we have had to work hard for every mile. I’m grateful for the challenges and the lessons learned. 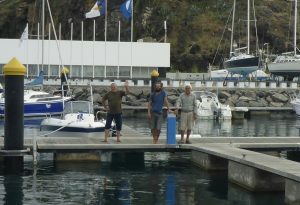 I am grateful to James Robi and Doc for pointing me in the direction of a Typhoon as the right boat for me. She’s handled everything thrown at her. Furthermore, if I had been sailing my choice of boat I would still be far from home. In lighter airs we simply would not have made progress. In particular the last few days heading north. And the last 24 hours. I’m utterly humbled be the whole thing. Thank you for listening this far. 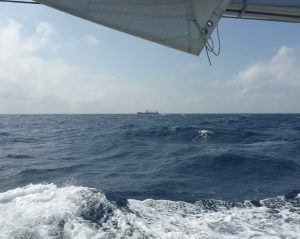 We are now 60 NM from Falmouth. I am now back on the iCloud email and normal texts etc. ‘Talisker 1’ and her Mate arrived in Falmouth today. We are anchored in St Mawes. 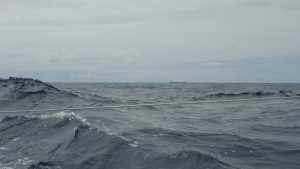 The passage from the Azores was 1,400 NM and took eleven days. I’ve had the munchies ever since I arrived. I’m showered and the cabin is back in harbour mode. I will sleep in my “State Room” tonight. 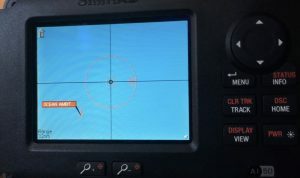 Since leaving Orford on the 1st June we’ve logged over 3,500 NM. More news when I’ve slept. War Ship. Cornish Coast & Lands End behind her. You must be happy with yourself and Talisker 1. Looking forward to seeing any video diaries you may have done. So is it an Atlantic circuit next year? Another good read James. Well documented…. You can be in charge of documenting on Taipan!! Cor thanks Kris …. I’m so pleased me n ‘Talisker 1’ have been in the ocean. Seems as though it must have been somebody else who did it now. Congratulations James, a great achievement. Read all your blogs. Followed you all the way there and back on AIS. Great to see pictures of Talisker1 you obviously think the world of her! I do think the world of her. She’s taken me to Shetland and Norway and now in to the Atlantic. She is a terrific sailing boat. As well as dealing with heavy weather she sails beautifully in the lightest of airs. I promise I’m looking after her. If I do that … she will look after her weakest link. I hope to see you again one day.